“Tow on the ground” 4-Wheelers are equipped with standard 3" valves to eliminate lifting to “dump” tanks. Weight Empty: 24 Lbs. and Full: 135 Lbs. Features double wheel, front-swivel design for easy pulling and maneuvering. Bobber Guage, all hook up/dump fittings, and tow handle. 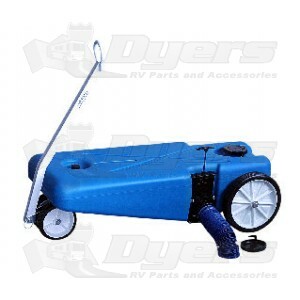 Dyers has the best price on this item and shipping was incredibly fast. Tote is well built, sturdy and manufactured with quality products and components. The dump valves sit low to the ground on my trailer so there is very little elevation difference when dumping into the tote which takes a little more effort and time to empty the tanks. Dyers was very fast on shipping and price was excellent. The 16 gal tote work great. I'm glad I got the Barker tank with the shut off valve. I have an older camper and the only thing that i found out was, i need lifts to bring the camper higher than the portable tank for the sewer to drain right. So all i need now are lifts and i will be all set. The portable tank is great once i get things right with the camper.. I have not used this product yet, but it seems well built and my son has used it for grey water.